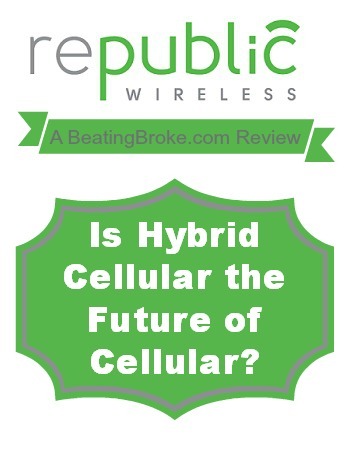 Republic Wireless: The Future of Cellular? Disclaimer: I was given a free Motorola Defy XT and three months of service with Republic Wireless in exchange for an honest review of the service here. Cellular service has long been dominated by a select few carriers who are essentially free to charge whatever they please for the service that they provide. Depending on which of the better known carriers you go with, a smart phone with a data plan will cost you anywhere from $50 to $100 a month. Several months ago, I cancelled my account with one of those carriers and started a trial of Republic Wireless. I think, as part of reviewing the service, that we discuss what it is, exactly, that Republic Wireless is. The service they offer is something that I like to call Hybrid Cellular. Traditional cellular service pushes every call off of the carriers cellular towers. Data, if you have a data plan does the same thing. If you connect to a Wi-Fi router, some of that data goes over that connection instead, but the calls always go over the cell towers. Republic’s hybrid cellular system pushes everything over the Wi-Fi signal if you’re connected. What that means is that both calls and data usage go across your Wi-Fi internet (or whomever’s connection your connected to) whenever you’re connected. The only time you use a traditional cellular signal is if you’re not connected to a Wi-Fi network. If you think about how often you’re near a Wi-Fi signal, it makes some sense. And, you’re already paying for your home internet, and you likely have a Wi-Fi router installed. Starbucks has one. McDonalds has one. You probably have one at work. I do. Anytime I’m near any public Wi-Fi, I just connect my phone and my calls and data go over that signal instead of the cellular network. What Phones/Plans does Republic Wireless Offer? Here’s one of the catches to the service. There isn’t much for selection on phones. When I first signed up for the service, the only phone available was the Motorola Defy XT. It was a bit better than the previous phone that they had offered, but it’s still a bit of a budget phone. I’ve constantly run into issues with it’s small internal memory size, and had plenty of issues with it freezing up and needing to be hard reset (pull the battery). In November, they’ll begin offering the Motorola Moto X, a significant upgrade to the Defy XT. As with other non-contract cellular providers, you’ll have to shell out a bit for the phone itself, but you win in the end without a contract. Plans are a bit of a mixed bag. When I first started on the service, there were two plans. The first was a $19 a month plan that offered unlimited everything, and a price tag on the Defy XT of about $200. The second plan was $29 a month for the same service, but the cost of the phone was about half. Until the Moto X is released, the only plan is the $19 a month plan with a price on the Defy XT of $99. Still a pretty good deal. The Moto X will be released, in November, with four available plans. $5 a month — Unlimited data, voice and text on Wi-Fi only. You must be connected to a Wi-Fi network for the phone to work. $10 a month — Unlimited data, voice, and text on Wi-Fi plus unlimited voice and text on cellular. $25 a month — Unlimited data, voice, and text on Wi-Fi plus unlimited voice, text and 3G data on cellular. $40 a month — Unlimited data, voice, and text on Wi-Fi plus unlimited voice, text and 4G data on cellular. You can change plans at anytime during a month (up to 2 times a month), so if you’re planning on going on a long trip and will need the faster data speeds, you can bump the plan up. Or, if you’re finding that you’re on Wi-Fi everywhere, you can bump it down to a lower plan. The phone, with all of the plans is going to have a $299 price tag on it. What’s the Verdict on Republic Wireless? If you’re like me, you’re thinking that all that info above is really nice, but how’s the service? Turns out it’s a bit of a mixed bag. If you’re on a Wi-Fi network with a strong signal, you’re unlikely to be able to tell the difference between the service and any other cellular phone. It’s when you’re on the cellular network that you might see some issues. Republic Wireless uses the Sprint network for it’s cellular service, which means that their cellular signal is only as strong as the Sprint signal is in your area. For me, that means the cellular signal is spotty to non-existent. The town I live in is the last town, heading west in my state, with any Sprint towers at all. They’re remainders from the Nextel buyout. What that means, for me, is that if I head west, I lose all access to data over the cellular signal for at least 1000 miles or more. Considering I head that direction at least a couple of times a year, it’s almost a deal breaker for me. The truth is, I don’t travel often. When I do, the cellular signal is sort of spotty anyways, so it’s not that much of a downgrade. And, when I’m not traveling, I’m usually at home or at work. And I have Wi-Fi in both of those places. 90%+ of the time, Republic Wireless gives me just as good of a service as any other carrier for a fraction of the price. One of the other sore spots for me, at the moment, is the Defy XT phone. It’s been a bit of a lemon from the word go. It’s got terribly low amounts of internal memory, which cause all sorts of issues with the phone. Some apps, unable to be moved to the external memory card, hog up the resources and cause the phone to freeze, halt, and overall perform poorly. The Moto X, to it’s credit has 16GB of internal memory, which should be about enough for anyone. I haven’t decided what I’m going to do yet. For sure, I’ll be testing out the Republic Wireless service for a few more months, until the Moto X comes out and deciding if I want to do the upgrade or not. It seriously pains me to think that I might have to go back to $100 a month service, especially after having paid only $19 a month for the last month or so. The bottom line is that your results with Republic Wireless will largely depend on how strong the Sprint network is in your area. If it’s a little weak, like it is in my area, you might find yourself in your grocery store with no way to pull up an electronic coupon (true story). It it’s a strong Sprint area, you probably won’t have any issues with it at all. Make sure you check their coverage map before you commit to over $100 in phone costs. In any case, I think you’ll likely want to wait until November when the current release date for the Moto X is scheduled.